Kennedys And King - Max Holland Says Enough! On December 12th, Max Holland unleashed another volley in his gaseous but incontinent war against all those who remain doubtful about the official version of President Kennedy’s assassination. That is, those who do not buy the Warren Commission Report. What was the occasion for this sallying forward on his black horse? Holland didn’t like all the attention that the media had been paying to the JFK case. 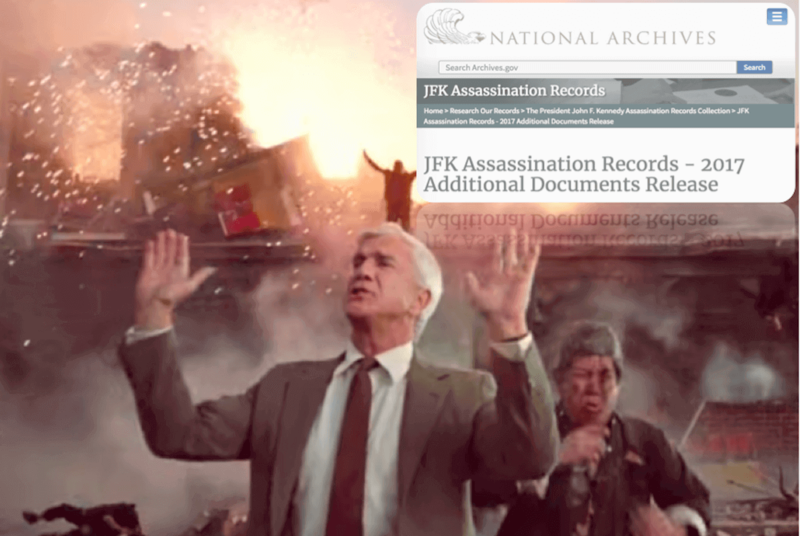 There had been a recent two-week debate on whether or not—in keeping with the congressionally passed law—all the documents left over from the Assassination Records Review Board (ARRB) should finally be released to the public in complete and unredacted form. What disturbed Holland is that this debate extended over into the MSM. Exaggerating only slightly, Holland’s complaint was that he was not allowed to dominate the press and air waves for that two-week period. It does not take long for the maestro of misinformation to get to his polemical point. In paragraph five he says the newly released documents tell us nothing we did not already know. Therefore, in the cozy comfort of the pages of the Weekly Standard, he can pronounce that this whole national cacophony has been, in Max’s terms—borrowing from a famous English playwright—Much Ado about Nothing. Which, right off the bat, tells us that Holland is up to his old tricks. The main one he uses is this: he does not reveal anything new or important to his readership, so he can then make ersatz pronouncements, like the above. In fact, his web site, Washington Decoded, specializes in this technique when dealing with the JFK case. Let us take some examples to show just how blindfolded Holland is. Most objective observers would say that the revelation that Mayor Earle Cabell of Dallas—brother of Deputy Director of the CIA Charles Cabell—was a CIA asset would be of some importance. Especially since President Kennedy was murdered in Dallas under rather suspicious circumstances. Another document released a few weeks ago says that an electronics store owner told the FBI that Jack Ruby had been in his shop a couple of weeks before the assassination. Ruby’s companion at the time was Lee Oswald. Ruby told Oswald to write down the proprietor’s name for a complementary pass to his club. Needless to add, the Warren Commission concluded that Ruby and Oswald did not know each other. A third revelation is one that corrodes the Warren Commission mythology of Oswald being in Mexico City. The CIA had two informants inside the Cuban Embassy there. That embassy was supposed to have been visited by Oswald more than once while the alleged assassin was in Mexico City. The two informants told the CIA that neither one of them had seen Oswald at all while he was supposed to have been in that domicile. Again, this raises the most serious doubts about the Commission and its inquiry into Oswald and Mexico City. And this was an important part of the Commission’s indictment of Oswald since they used this information to portray Oswald as a communist, trying to get to Russia through Cuba. But if Oswald was not there, and in fact was being impersonated, this would alter that portrait in a 180-degree manner. One last example: it turns out that Jim Garrison was correct about Clay Shaw. The latest documents, even before this last release by NARA, revealed that Shaw was a highly valued and compensated CIA contract agent, a fact that the Agency had done all it could to conceal from the public. (Joan Mellen, Our Man In Haiti, pp. 54-55) It now turns out that the internal deception by the CIA about Shaw appears to have gone even further. One of the ARRB releases from when it was active, 1994 to 1998, revealed that the Agency had destroyed something called Shaw’s ‘Y’ files. It now appears that the destruction of Shaw’s files extended even further, into his 201 file. (See this ARRB memo) As I have written about this matter previously, this trail of mangled files concerning Shaw affirms something that the late Gordon Novel wrote about back in the seventies. Namely that in 1964, while the Warren Commission was in session, the CIA began a cover-up about Shaw’s true Agency status that would continue through the days of the House Select Committee on Assassinations, 15 years later. Therefore, right at the start, as he usually does, Holland fails the smell test for any responsible journalist: He is not being candid with the reader. From there, Holland goes into a mini history/summary of what the ARRB did in its four years of active existence. Holland broaches the comical when he writes that, in its dealings with intelligence agencies, the “Secret Service was probably the most difficult agency, in that it actually tried to classify documents in an effort to keep some information secret.” As more than one reporter has documented, the Secret Service actually destroyed documents from a crucial period of time—1963—while the ARRB bill was being enacted. (See ARRB Final Report, p. 149) According to Doug Horne, who worked for the ARRB, this caused a significant disturbance within the Board as to how public they should make what they considered a deliberate defiance of the law. Holland then concludes that many of the still classified CIA documents fall under the rubric of NBR, or “Not Believed Relevant”. The insinuation here seems to be that critics are confusing that category with those "Postponed in Full", and thus are exaggerating the number of documents the ARRB deemed relevant but which have not yet seen the light of day in fully unredacted form. NBR was a curious designation that the ARRB accepted as a reason for maintaining secrecy. But Holland’s assertion is not correct. The NBR documents clearly constitute a separate group, a fact which anyone can figure out by just looking at how many exist. According to Freedom of Information attorney Jim Lesar, they run into the tens of thousands. And surprisingly, according to John Newman, the Cabell document mentioned above was originally classified as NBR. The latter has always been distinguished from those the ARRB "postponed", and their counts understood to be separate. Another dubious point the author states is that if the ARRB had stumbled across any fact that challenged the official verdict, the release would have been instantly approved. The curious point about this statement is that it comes from David Marwell, the former ARRB Executive Director. As everyone who followed the ARRB knows—but Holland does not reveal—Marwell did not endure the entire four years of the ARRB. He left after something more than two years and was replaced by Chief Counsel Jeremy Gunn. But while Marwell was there, he struck up friendly relationships with the likes of Gerald Posner, Gus Russo and, of course, Max Holland. (Doug Horne, Inside the ARRB, p. 13) In fact, Holland quotes Marwell as having been disappointed in the splurge of coverage during the October 26th period, because according to Holland, Marwell thought the goal of the ARRB was “not just preservation and transparency but closure.” If Marwell really said that, it shows why he was meeting with those three authors. As more and more shortcomings of the ARRB become evident over time, this essential problem that Horne first exposed becomes rather important: Did the Board perform a zealous inquiry into pursuing its mandate, and was it equipped by law to do so? When one considers the cases of Terri Pike and the Air Force One tapes, the verdict would appear to be in the negative. (See “The Railroading of LCDR Terri Pike” and “ARRB Search for AF1 Radio Tapes”) And, in fact, one achievement of the 2017 effort at declassification is that some commentators are now reconsidering their original verdict on the ARRB in light of the newly declassified record. One of the silliest parts of Holland’s silly essay is when the tries to use the Board’s work as proof that the Warren Commission verdict was left intact. Because the way he does this is, as is his technique, to ignore what the Board did. Or to assume that either Marwell or the Board would be cognizant of each and every document that the Board declassified. We know, however, that they did not read the vast majority of those 2 million pages. Take this example: he writes that the Board never found any evidence that anyone but Oswald fired the shots in Dealey Plaza. Yet during the ARRB session, Noel Twyman found a receipt for a 7.65 Mauser shell recovered from Dealey Plaza. This ties in with the first identification of a rifle found at the Texas School Book Depository being a 7.65 Mauser rifle. (James DiEugenio, Reclaiming Parkland, p. 92) Did Oswald have two rifles, and did he fire them both that day? But since no one edited this piece at Weekly Standard, Holland was allowed to continue in his nonsensical vein. He then goes on to say that there was never any evidence of involvement by Oswald in any conspiracy; that Oswald never worked for the FBI or CIA; and neither agency had any evidence that should have landed Oswald on the Secret Service’s Security Index prior to the assassination (which would have removed him from the Dealey Plaza area on the day Kennedy was killed). But, beyond that, consider this as to a relationship between Oswald and the CIA. Pete Bagley was an assistant to CIA counter-intelligence chief James Angleton for many years. British researcher Malcolm Blunt became friends with him a few years before Bagley died in 2014. In an email communication with this writer, Blunt conveyed something that seems of the utmost importance to this question. Bagley asked Blunt to map the routing of the first cables about Oswald as they went through the CIA. When Bagley asked Blunt if a pattern like that betrayed whether or not Oswald’s defection to Russia was witting or unwitting, Blunt said he was not sure; but he guessed unwitting. Bagley said he was wrong. A routing pattern like that, around all the places the files should have gone, betrayed that Oswald’s defection was witting—meaning the CIA expected it and was planning in advance. So much for there being no connection between Oswald and the CIA. But Holland does not object to the commentators on those grounds. He actually states that any criticism of the CIA, the FBI or the ARRB was unwarranted. In other words, the idea that Philip Shenon—a very popular guest at the time—tried to propagate, that the CIA somehow screwed up by not reporting Oswald to the Secret Service, not even that is merited by Holland. In Holland’s solipsistic universe, historian Michael Beschloss is irresponsible when he says there are still mysteries about the JFK case and documents in the files can explain them. Holland does not even think that anything Oswald said or did in Mexico City amounted to an intelligence failure by the CIA or FBI. As John Newman wrote in his book Oswald and the CIA, even former CIA employees—like Jane Roman— admitted such was the case. But this is the second CIA employee ignored by Holland, since they both defeat his argument. Consider what Holland is saying: Oswald was a former defector to Russia who returned to America with a Russian wife, whose uncle was in the Soviet NKVD. Oswald then goes to Mexico City seven weeks before the assassination. There, he reportedly talks to the alleged KGB head of assassinations in the Western Hemisphere, Valery Kostikov. While there, Oswald arranges for a visa that would take him from Cuba to Russia. He then returns to Dallas and gets a job on the President’s parade route about a month in advance of Kennedy arriving there. And somehow, none of that should have been reported by the CIA to the FBI or Secret Service. Even though the CIA had about seven weeks to process it before the assassination. With this, Holland resembles the late Leslie Nielson as Lt. Frank Drebin, telling the spectators, “Nothing to see here!” as the building behind him explodes in flames. But we would not be dealing with Max Holland if something written by him did not mention the late Mark Lane. Holland found space to actually repeat his ridiculous charge about Lane’s volunteer Kennedy research group being funded by the KGB. If anything shows just how irresponsible Holland is, this phony charge does, because it was effectively demolished by Lane himself. (See “How Max Holland Duped the Daily Beast”) But Holland then extends this to say that it was Earl Warren who decided to take the ideological charge out of Kennedy’s murder by saying Oswald was only a lonely communist and there was no Cuban or Russian control. Even for Holland, this is pretty bad. As anyone who has read the declassified record of the Warren Commission, it was President Johnson who told Warren that he had to remove Oswald from any sphere of influence by Cuba or Russia, or else nuclear holocaust was threatened. After that pronouncement, Warren was reported leaving the White House in tears. Warren was effectively neutralized after this. He did not want the Warren Commission to perform any kind of active investigation at all. He even ventured that maybe they should not even call any witnesses. (DiEugenio, Destiny Betrayed, p. 359) As recently revealed by Bill Davy at a talk at VMI, Warren told a judicial colleague at a conference in Florida that he bitterly resented what Johnson had done to intimidate him. He admitted that the Commission had been a cover-up, and he was ashamed of it. (See “Bill Davy at the VMI Seminar”) One should add that to Gerald Ford’s later conversation with French president Valéry Giscard d’Estaing in 1976, where Ford revealed that there was an organization that killed Kennedy. We already knew that Warren Commissioners John Sherman Cooper, Hale Boggs and Richard Russell publicly defected from that original verdict within just a few years. In fact, as Gerald McKnight revealed in his book, they had to be duped into going along with it in the first place. (James DiEugenio, Reclaiming Parkland, pp. 317-20) Which means that of the original seven members of the Warren Commission, five of them were either intimidated or conned into going along with the 1964 verdict. This leaves Holland siding with the likes of Allen Dulles and John McCloy, because they are the only two who are left today. Because of his rigorous use of censorship, Holland can close with both an unwarranted assumption and a large crevice in his argument. Concerning the latter, he does not detail the fact that even to this day, NARA is issuing documents that are heavily redacted, sometimes illegible, with many containing pages that are completely blank, as well as issuing cover pages that have no accompanying report attached. If Holland was not going to detail all of this, then what was the point of his article? To somehow blame the state of America today on the still classified state of the record in the JFK case tells us very little about the former. But it tells us a lot about Max Holland’s JFK mania.